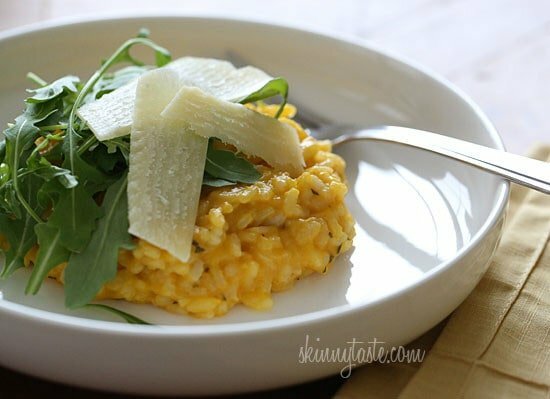 A rich and creamy Italian rice risotto dish made with butternut squash puree, white wine, Parmigiano-Reggiano and topped with a little fresh arugula. 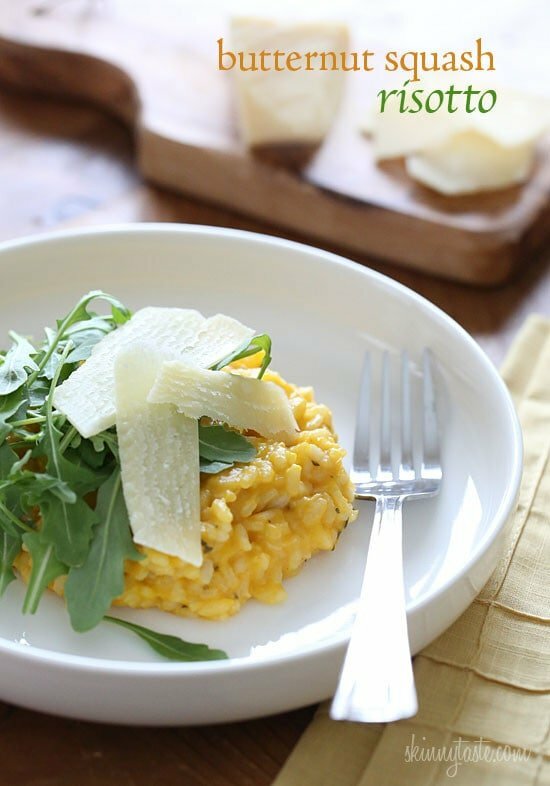 Some of my favorite risotto recipes also include Spring Asparagus Risotto, Creamy Mushroom Risotto, Seared Scallops over Wilted Spinach Parmesan Risotto and even Carrot “Rice” Leek and Bacon Risotto and Quinoa Risotto. Happy Monday! This weekend I remade one of my older recipes with meatless Monday in mind, and updated the photos because this is such a great dish, but the photos didn’t do it justice. 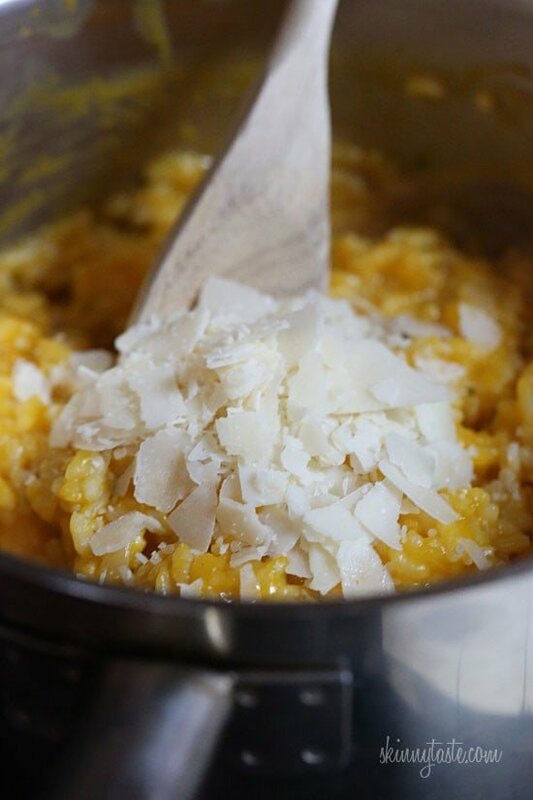 Making risotto is a labor of love, because you have to be patient, stirring the rice and adding more broth a little at a time, but in the end you get a delicious restaurant quality dish that you can proudly say you made yourself, without all the added butter you would get if you ate this dish out. It’s also really filling, one serving will fill you up. If you wish serve it with a salad on the side and call it a meal. 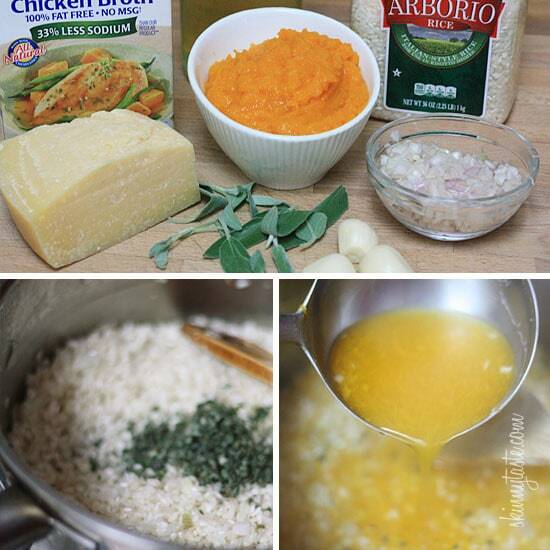 This also makes a great side dish to fish or chicken, I would make the serving size 1/2 cup as a side dish. I started with some homemade squash puree which I simply made by boiling the butternut squash in broth or water, then pureeing in the blender. You can use the rest for some Spaghetti with Creamy Butternut Leek Pasta later in the week. I like to keep a good cheese such as Pecorino Romano or Parmigiano-Reggiano on hand and grate it myself when I need it. A good cheese has an intense flavor you just can’t get from the grated parmesan cheese sold on the shelves of the supermarket. In a large saucepan, heat broth and butternut squash puree over medium-high heat. When it boils, reduce heat to a simmer and maintain over low heat, taste for salt and adjust as needed. In a large heavy saucepan over medium heat, heat oil or butter until melted. Add shallots, garlic and rice; saute until the rice is well coated with oil or butter, about 3 minutes. Add the wine and sage and stir until it is absorbed. Add a ladleful of the simmering stock; wait until it is absorbed before adding another ladleful stirring gently and almost constantly. Stirring loosens the starch molecules from the outside of the rice grains into the surrounding liquid, creating a smooth creamy-textured liquid. Continue this process until the rice is creamy, tender to the bite, but slightly firm in the center and all the stock is used, about 25-30 minutes from the time you started. When all the liquid is absorbed, stir in the grated cheese and remove from heat. 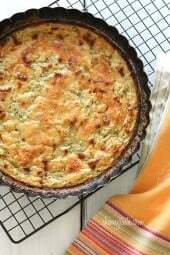 Serve immediately and top with baby arugula and extra grated cheese if desired. This risotto was delicious! I made it for a family get-together and it was certainly a hit. I was wondering if it an be done in the Instant Pot. Has anyone tried that method? I have some fresh pumpkin purée – do you think I could use that instead of the butternut squash? Can you make this with quinoa? 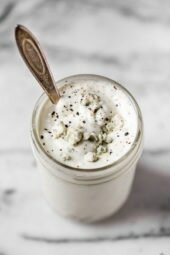 If so, how would you alter the recipe? Delicious! This was perfect for the first cool, rainy day of Fall. Prep all ingredients before starting dinner. 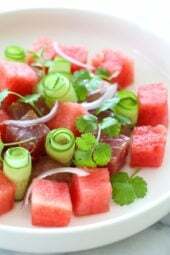 This recipe needs a little attention, but it is worth the time. 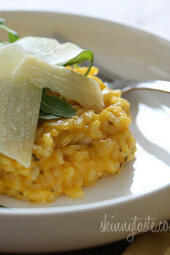 You can also make this risotto in the Pressure Cooker! Just add cheese after it is done in the cooker! High Pressure for 6 minutes with a quick release! YUM! I made this as a Thanksgiving side dish, and my nonna, whose specialty is risotto, couldn’t believe how well it came out! My mom also begged to keep the leftovers. Such a big win, as are all of your recipes. Thank you, thank you, thank you! This was a winner! Added some ground sausage to make it a meal. Husband and I both loved it!